Marble cake is a wonderful old-fashioned baked good, as pretty as it is delicious. 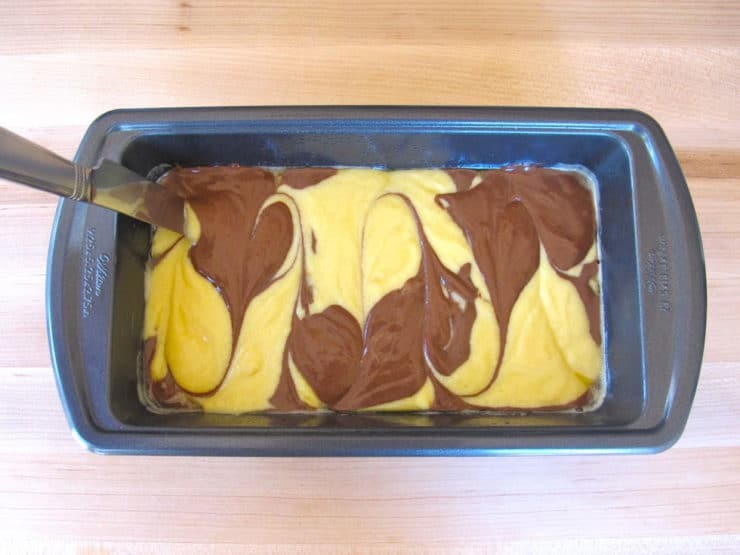 The idea of marbling two different colored batters into a cake originated in nineteenth century Germany, then made its way to America with German immigrants before the Civil War. 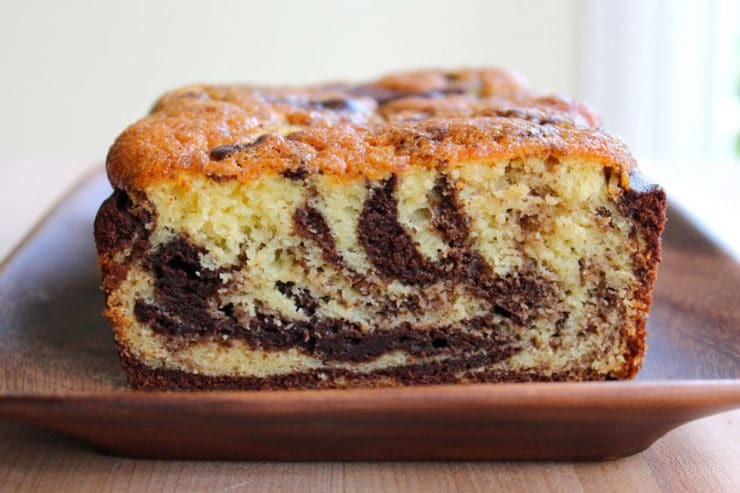 Marble cake has a Jewish history as well… in fact, the first American recipe for marble cake showed up in a Jewish cookbook! For my Marble Cake recipe, click here. 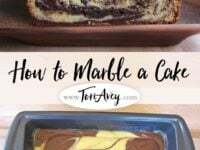 Learn how to marble a cake using two different colored batters, a checkerboard pattern, and a knife. You will also need: baking pan for cake batter, large spoon, butter knife. Place your colored cake batters near your baking pan. Take 1/3 of the first colored batter and scoop it with a large spoon into your pan in a down-up-down pattern. 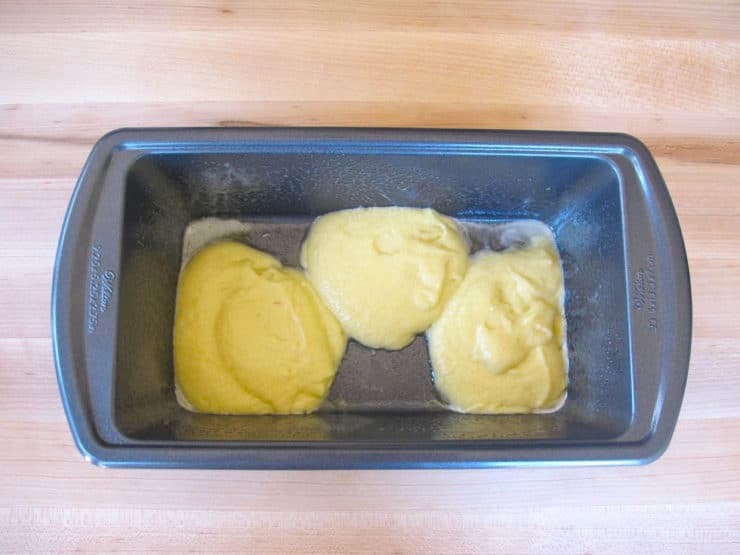 If you're using a small loaf pan (as shown here), use three large dollops of batter. If you're using a round tube or bundt pan, drop dollops of batter in the same pattern--down, up, down-- all the way around the pan. Take 1/3 of your second colored batter. Scoop a dollop of the batter into each of the empty spaces to create a rough checkerboard pattern on the base of the pan. 1/3 of your total batter should be used at this point. With the second 1/3 of the batter, create a second checkerboard pattern on top of the first. Alternate colors-- meaning, if a light colored square is on the bottom, put a dark colored square on top. 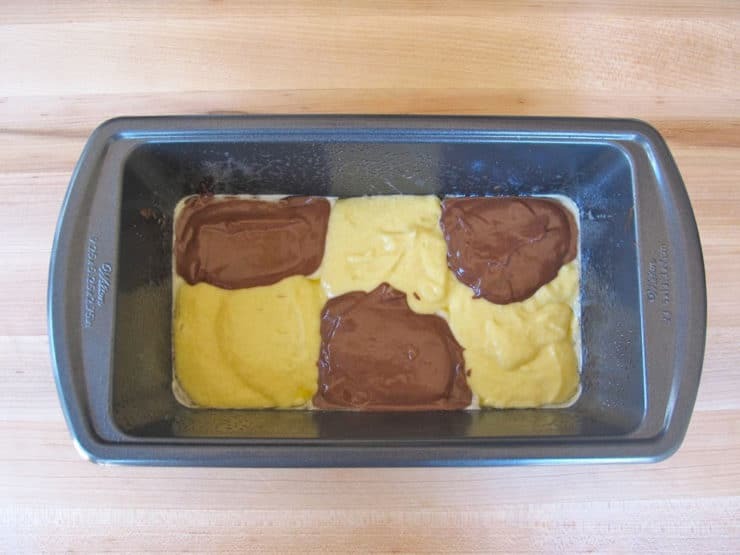 Repeat the pattern for a third and final layer with all the remaining batter. 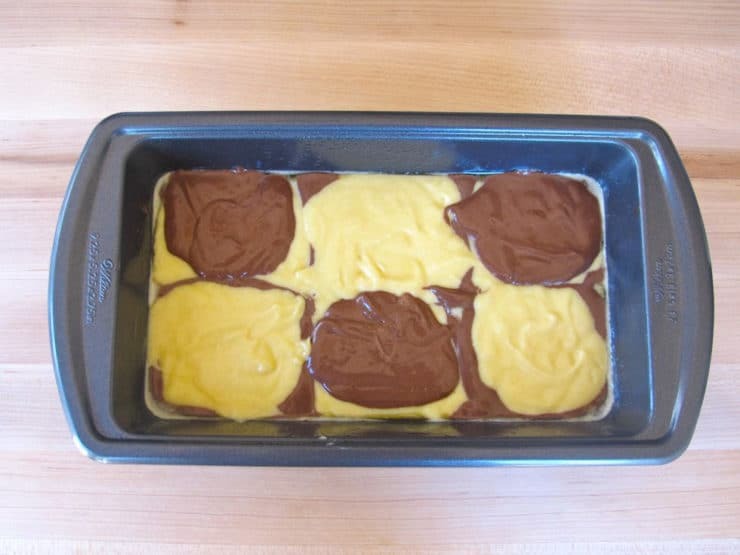 You should have three checkerboard layers in your baking pan now. Take your butter knife and swirl it through the batter, making rounded vertical zig-zags from one side of the pan to the other. Wipe the excess batter from the knife. Repeat the swirling pattern in the opposite direction. If you're using a loaf pan, make long horizontal swirls. If you're using a round tube or bundt pan, swirl opposing zig-zags all the way around the pan to create a chain shaped swirl. Resist the urge to make lots and lots of swirls-- the more you swirl, the less the cake will look marbled, and the more it will look like a mish-mosh when you slice it. 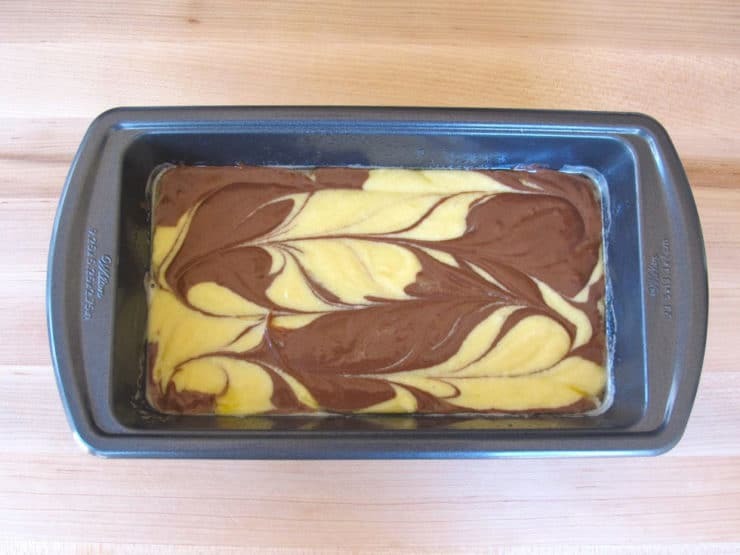 Now your cake is marbled and ready to bake! When it's baked, cooled, and sliced, you'll see nice, evenly marbled patterns. Your cake will have its own unique variations. That's what make marble cake fun... you never know exactly what it will look like inside! 🙂 For my marble cake recipe, click here. Note: Nutrition facts above refer to yellow cake batter for 1 whole 9-inch cake. Is cake flour all purpose flour. No, it is more delicate and finer. This cake turned out wonderfully! I doubled the recipe so I could teach a 9 year old neice how to make her own marble cake. She had so much fun making it and loved the flavour so much that she wants to make it with her mom for their next party. It was a real hit with the adults too haha. I used red, white, and blue batter and it looks amazing! Thanks for showing me this technique! Is it possoble to do 3 different colour marble? I didn’t use the recipe, only the marbling technique. I had never marbled a cake before but this worked perfectly!! Thank you so much! can i use oil instead of margarine? Suri, if you are using my recipe, I do not suggest subbing oil for butter or margarine. I followed your directions completely. Why hy does the cake split in a couple of places? Bonnie, I’m not sure which recipe you used – it sounds like an issue with the recipe/cake batter, not the marbling technique. Marble cake has always been my favorite box cake mix but they have become hard to find them. I am so happy I found your recipe. Also I like the way you spoon the batter into the pan in 3 checkerboard layers. I’m going to try it very soon. One question, can you leave the batter in the checker board pattern? Hi Joy, Tori’s assistant Ashley here! 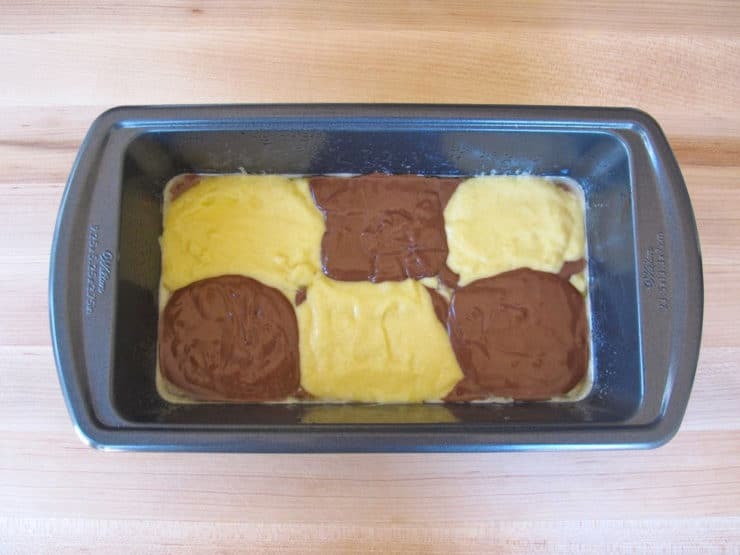 You can certainly leave the batter in the check board pattern if you prefer, though I don’t think the resulting cake will have a clear checkerboard pattern. Is there enough batter to make this in a bundt cake pan? Susan this is not a recipe post. If you’re referring to the Marble Cake recipe on the linked page, no, I don’t think it’s enough for a bundt pan– just a loaf cake. I would double it. can you use any 2 cake recipes? or does it have to be a marble cake recipe? Hi Cal, it has to be some sort of marble cake recipe. Marble batters are made with the proper consistency for marbling, other cake batters are often too thin/runny to marble. Thank you for this tutorial! I’ll need to make another marbled cake and try it! Can i make this in a 8-9 inch round pan? Hi Rebecca, Tori’s assistant Ashley here! We’ve only used this marbling method in a loaf pan, so unfortunately I can’t say for sure how well it would turn out in a round pan. This is a lovely marble cake that i have been looking for.Juicy and soft. My husband and my son luv this cake. I have been baking this cake every week (now for the 4th week)!I am begining to think that my famous fruitcake is no.2 now in our fav.list. Thanks for the wonderful recipe.Excellent. you are the best Tori!!! This cake looks & sounds delicious! I can’t wait to try it out!I just stumbled across your beautiful blog – I look forward to popping back soon for some more lovely inspiration! 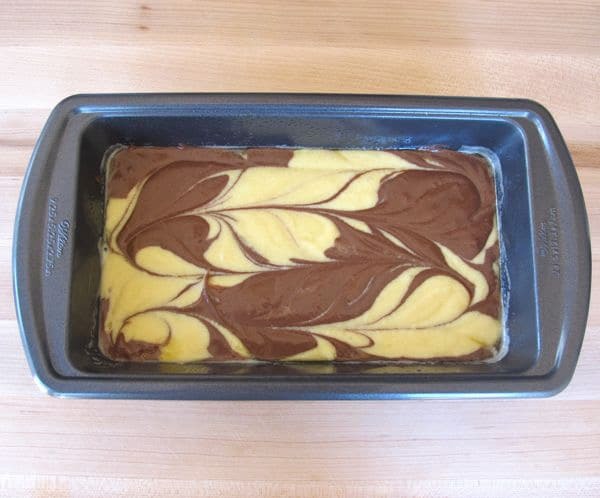 I made the marble cake….and it was perfect! Thank you so much for posting the recipe. So glad you liked it Juliet! This cake is fantastic!! Thank you for sharing such a wonderful recipe! It is so moist & delish! I grew up eating the best cakes and breads..our father was the owner of a jewish bakery in The Bronx, then Long Island, NY. I had been searching for the “ultimate” marble loaf..I found it in your recipe..During the holidays, the cake, was a favorite among friends and family. Thank You for bringing back the memories..Loved the vanilla pudding add on. That’s great to hear Susan! Thank you! I was nervous to try marbling, but thanks to your instructions, it was very easy. So easy and yet such a beautiful effect!! Thanks for sharing. 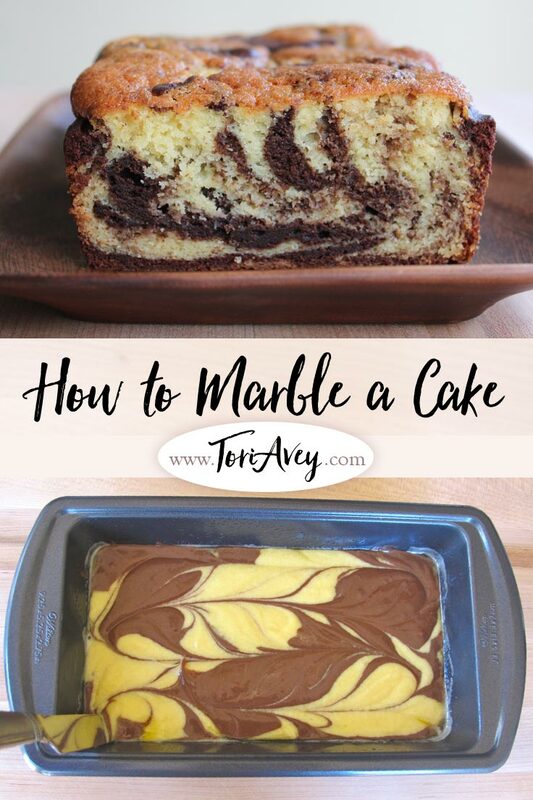 What a beautiful marble cake! Thank you for the detailed instructions and photos. first time here..love your space..
gorgeous posts with inviting cliks.. I couldn’t understand what you meant by “down up down” pattern in the instructions, but the photos were clear. This was a wonderful tutorial. Good reminder on how to do this. I dont think I have done a marble cake for years! Hope you are doing well! Just catching up with everyone after several hectic work weeks! I’m a friend of Renny & Sharon. Congrats on your accomplishment on ur cooking show. He is so proud of u. I hope u don’t mind but I would love to try ur marble cake… It looks sooo yummy. Hi first time here….great tutorial….just what i was looking for…. Great tutorial. I love marble cake. It’s just so fun to make and eat.